Ooooh! I just finished reading the Arts & Leisure section of The Sunday New York Times. I always read that first, before that paper’s steaming intelligent analysis of current events. I swear reading it raises my IQ ten points. But somehow ‘the arts’ draw my attention first, before all the depressing news about war and hurricanes and earthquakes and epidemics. This Sunday’s theatre-movie-dance sections made me yearn to be closer to you, and richer!I would take you to Manhattan. Wanna know what we’d do? We’d take the train down the Hudson and stay in a cool hotel. Maybe even a Bed & Breakfast in SOHO (that’s an artsy village type district). The first day we’d go see the Christmas Tree in Rockefeller Plaza that the rock stars so often perform in front of on The Today Show. Then we’d watch the ice skaters, maybe even rent some skates and actually do that. Perhaps we’d walk up to Central Park Zoo or go to the Planetarium and see a light show. By evening after dinner perhaps at Nirvana in a Tent which has a view of all of Central Park, I’d’ve gotten great tickets to Radio City Music Hall for The Rockette’s Christmas performance. Wow, I just looked at the moving ‘preview’ on the website* ! 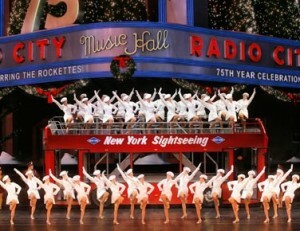 My grandmother took me to see The Rockettes, a long long time ago when I was your age. I don’t remember it being like this, it’s even MORE spectacular. I will never forget how the dancers legs looked: all the same and doing the same motions all at once. I took dance lessons, but could never do anything like that. And then at the end when Santa’s sleigh comes in … there was all this steam on the stage. It was really magical. And that is just the beginning of all the places we would go, IF I were your visible grandma. So right now I’ll keep wishing and wonder about all the Christmas traditions your parents are putting into your memory banks. P.S. As I was humming this tune: “City sidewalks, busy sidewalks dressed in holiday style. In the air there’s a feeling of Christmas” my heart just jumped. As I looked at the cities for the national tour this holiday season, the town Anne lives in is on it! I guess I’ll just ‘intend’ that Suzie takes her whole family …. Sigh! Sure wish I could be there to see your faces.